In anticipation of the newest installment of the Rotating Gallery, Dawn of the Great War: A World War I Centennial Commemoration, the Museum will post special information and photos from WWI in the coming weeks. This article is written by Museum intern Victoria Kunhardt. Did you know? On February 1, 1917, Germany resumed lethal, unrestricted submarine warfare in an attempt to win World War I. This type of warfare was first introduced in 1915, when the Germans threatened to attack all merchant ships that entered the area around the British Isles. This is an example of a German U-boat submarine. Early in the war in 1915, the British ship Lusitania was the first passenger ship attacked and sunk by German submarines. The Germans killed 1,201 people, including 128 Americans. 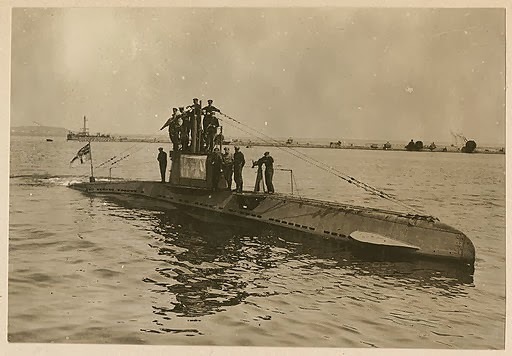 After this attack, due to pressure from President Wilson and other nations, the German government was persuaded to suspend submarine U-boat warfare. 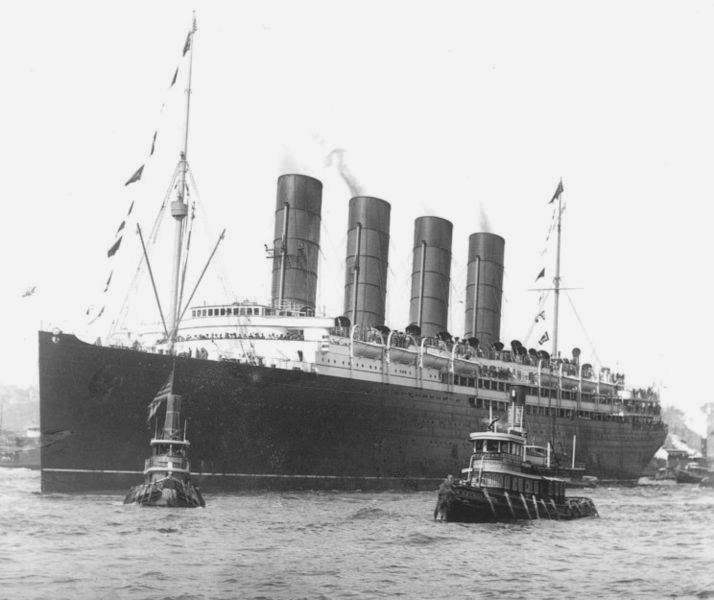 British passenger ship the Lusitania, sunk by German submarines in 1915. However, placed under strict constraints, the Germans continued to press for their more aggressive style of submarine usage. 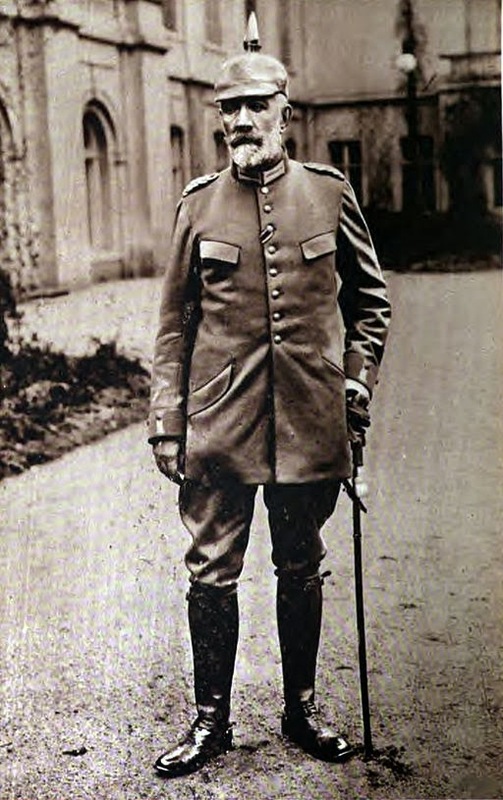 German navy commanders convinced the kaiser and Chancellor Theobald von Bethmann Hollweg that unrestricted submarine warfare could end WWI with a victory by the fall of 1917. Chancellor Hollweg announced to the world that these attacks would resume on February 1, 97 years ago. He said, "The destructive designs of our opponents cannot be expressed more strongly. We have been challenged to fight to the end. We accept the challenge. We stake everything, and we shall be victorious." The "Great War" did not end until the fall of 1918, and took the life of over 9 million soldiers; 21 million more were wounded. Civilian casualties caused indirectly by the war numbered close to 10 million. Are you interested in learning more about WWI? Dawn of the Great War: A World War I Centennial Commemoration will open to the public on Friday, February 28 for Wichita's first Art Day of Giving. The new exhibit will commemorate the centennial of World War I, the beginning of a war that changed the world. Dawn of the Great War will examine the early years of World War I, focusing on its causes and earlier battles as well as the new technology developed for the war. It will exhibit a wide variety of unique weapons, tools, and other artifacts from the major combatant countries as well as documents signed by some key players. Are you a Museum member? Please join us for the Exclusive Opening on Thursday, February 27. This early viewing will feature tasty hors d’oeuvres from local businesses, as well as fun and educational activities for all ages. Please contact the Museum at 316.263.1311 for more information on Memberships and a free invitation to this unveiling.